Gotta hand it to Laura for picking up on my intrigue. 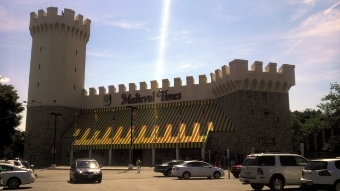 She and the kids surprised me with a trip to Medieval Times for a Fathers Day dinner and joust. Surrender to an age of bravery and honor and witness epic battles of steel and steed. From ringside seats, discover a feast of the eyes and appetite with more action, more fun & more excitement than ever before. 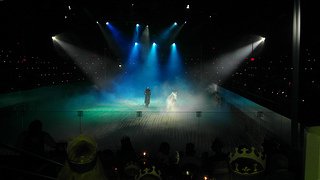 As you thrill to a rousing live jousting tournament, marvel at awe-inspiring horsemanship and falconry, Medieval Times serves a four-course meal fit for royalty…Our Knights’ dazzling displays of skill and athleticism demand the same respect as any on-field heroics as nearby Giants Stadium. First, we crossed the George Washington Bridge “way over yonder” to Lyndhurst, New Jersey, to arrive at a big boxy white castle. It stood proudly in a light industrial area adjacent a big parking lot for all the attendees. We arrived early to take advantage of preferential seating in the ring. Like a trip to Disney World, we witnessed the parking lot fill rapidly with a high density of older-model minivans and families from all walks of life. We then were greeted in the parking lot by a cast of about 20 Medieval Times actors and staff, who escorted us inside to pick up our paper crowns, whose colors corresponded to the knights we were to cheer on during the dinner joust. I absolutely loved how all the servants addressed me as “my Lord”. In the entrance hall, there were all sorts of attractions where you could easily drop hundreds of dollars — pretend medieval weapons, costumes, face painting, novelty photo-booths, dragon and knight figurines, crystal balls, a dungeon museum of “authentic torture devices”, and bars at every corner. A few Coors Lights later — plus a daiquiri for Laura, a knight costume for Julian and a princess figurine for Celeste — we entered the ring for dinner and the tournament. 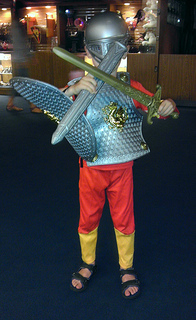 The knights battled it out on horses and with swords, while we feasted on tomato soup, garlic bread saucers, baked half-chickens, pork ribs, baked potatoes, apple pastry and Diet Pepsi. Our assigned “Blue Knight” turned out to be a loser. He broke down in almost every challenge and was carried out early. It reminded me of the WWE, when the script simply calls for your hero to stumble and fail without reason. Anyway, it was an awesome Fathers Day gift — a fun, odd and very middle-American experience. Oops! I emailed the wrong person!